We won 9 awards in the 2010 AWGA Competition. 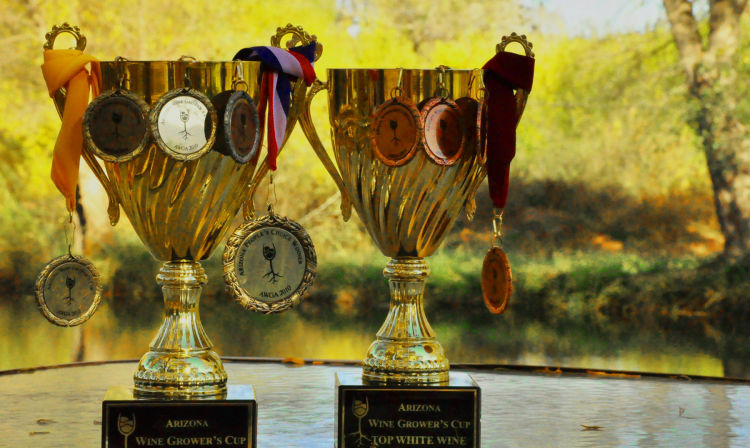 This is a very exciting time for Arizona winemakers and grape growers. There’s a very healthy sense of competition in the air. We continue to inspire each other in all areas of this fabulous art. And the results of this event echo that sentiment. All wines from all over the state showed very well. Arizona has arrived. Wine Growers category, Cad 08 Kitsune received the Gold medal and Wine Growers Cup for Reds, Merkin Vineyards 09 The Diddler received the Gold medal and Wine Growers Cup for Whites, Merkin Vineyards Lei Li Rose received a Silver medal for Rose’, Cad 09 Dos Ladrones and Merkin Vineyards 09 Shinola both received Bronze medals. Wine Makers category, Cad 09 Dos Ladrones received a Gold medal for Whites, Cad 08 Anubis and 08 Sancha won Bronze medals for Reds. Peoples Choice category, Merkin Vineyards 09 Shinola received the Gold medal for Reds.